The Hotel Serenella , 2 stars of Viserba, has uncovered parking, WI-FI in the common areas and rooms with air conditioning and balcony. No pets allowed. 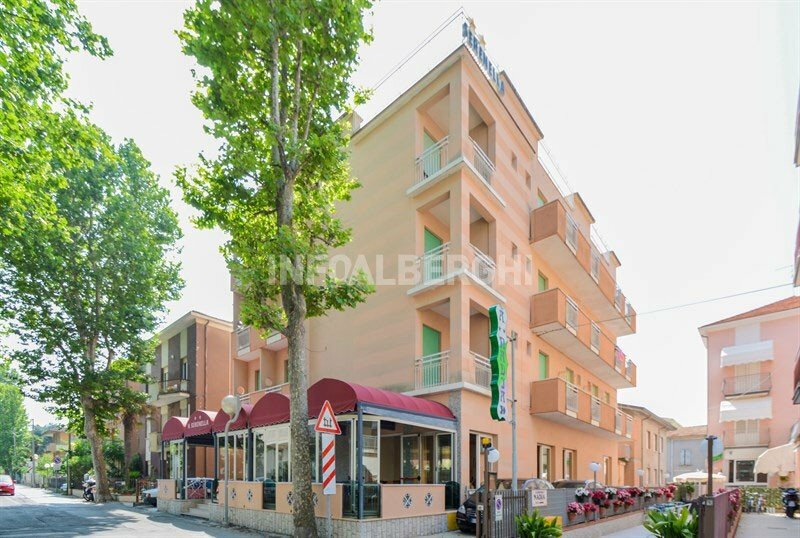 The Hotel Serenella is near the sea and in a convenient position to reach The Rimini Expo Centre. It is located in Viserba, a fraction of the north coast of Rimini particularly appreciated by families for its tranquility and its proximity to the Italia in Miniatura park. Adjacent to the hotel, the bus stop no. 4 which connects Viserba to the center and to the Rimini station (southwards) and to Viserbella and Torre Pedrera (to the north). The rooms are equipped with air conditioning, private bathroom with shower (on request), balcony with drying rack and chair, telephone, digital terrestrial TV, safe, telephone. Sea view on request. FAMILIES: the family rooms can accommodate up to 4 people and are equipped with cots, bath tubs and side rails for the children's bed. Large open-air porch equipped with chairs and tables, terrace, free bicycles, bar, 24-hour reception with night porter, air-conditioned restaurant, lift, pay laundry service, theme nights. BREAKFAST: buffet with homemade cakes, croissants, cereals, yogurt and savory breakfast with cheese and cold cuts. LUNCH AND DINNER: 3 choice menus followed by a buffet of appetizers and vegetables. Lunches are always closed with homemade desserts. In the room: cots, safety rails, bath tubs. At meals: baby menus, high chairs at the table. The hotel has an agreement with Bagno Gastone n. 21. From 2 to 30 June 2019 minimum stay of 4 nights. Free Child Up to 5 years and discounted up to 12 years. See all the details in the offer: "June - All Inclusive discounted!" In addition FREE children up to 5 years and discounts for children up to 12 years! - Dinner € 12 per person (including meat or fish menu and drinks). From 2 to 30 June 2019 minimum stay of 4 nights. Last 5 rooms available! Child free up to 5 years and discounted up to 12 years. Offer valid from 01 July to 04 August 2019 for a minimum stay of 7 nights. Rooms at € 39 / adult per night in B&B, minimum 3 nights. Available Half board or P. Complete!